Home » Health » What Is Anorexia Nervosa? Anorexia Nervosa is a mental health problem in which people are obsessed with having a skinny body and very afraid if they look fat. Because of the fear they even always consider his body is still less thin or still fat even thought the reality is not like that. The age of 16-17 is an age that is considered vulnerable to this disorder to begin to appear. The majority of people with anorexia come from young women and adult women. To keep their bodies as thin as possible, anorexics will try hard to limit the portion of food to a minimum, using drugs (such as laxatives and appetite suppressants), and excessive exercise. Some of them will even try to regurgitate the food that has been consumed, a hallmark of eating disorders called bulimia nervosa . However, if in bulimia the average person has normal weight or more, the anorexic patient has less weight. Significant weight loss and looking very skinny. Always pay attention to the shape of the body in front of the mirror. Weigh the body almost every time. Often regurgitate the already eaten food. Likes to lie if asked if they have eaten. It takes into account the number of calories, fat, and sugar in the diet. Having health problems as a result of anorexia itself, such as fatigue, dehydration , low blood pressure, dizziness , hair loss , and dry skin. The cause of anorexia nervosa is certainly not clear. Most specialists believe that the disorder comes from a mix of factors, such as psychological, environmental, and genetic or biological factors. Anorexia nervosa disease on average can be recognized from the physical sufferers who appear very thin. But doctors still have to ask their diet to make sure the shortness is due to eating disorders and not other diseases. In addition, the doctor may also perform examinations on hair, skin, blood pressure, lung and heart conditions. Even X-rays and blood tests will be done if needed. There is a small percentage of anorexia nervosa sufferers who are unaware that they are suffering from the condition, but most know and do not seek treatment for fear until they finally hide this problem for a very long time. It is therefore important for us as outsiders to recognize this condition whenever a family or friend experiences it. If you have a family or friends with anorexia, do a subtle approach and persuade them to seek medical help. Persuading anorexia for treatment is not easy. Usually they will assume that what they have done is the right thing and will refuse to admit that they are actually in trouble. That's why patience and continuous support play a very important role for the recovery of anorexia sufferers. Never criticize or make them feel depressed because it will only worsen the situation. Convey that your persuasion and support are solely for fear of their health. Anorexia nervosa should be treated as early as possible so that the chances of recovery are greater. The goal of anorexia treatment is to change their view of healthy weight and improve their diet. Most cases of anorexia are treated with outpatient and a handful of other cases, such as cases of people with severe anorexia, treated with hospital care. In addition to sensitize people who live their lifestyle is wrong, this handling is aimed so that they can obtain ideal body weight back safely. Matters that include the treatment of anorexia include psychological therapy and suggestions related to food and nutrition. In order for the treatment to be performed properly, the physician must adapt to the physical, psychological, and social conditions of the anorexic person. Treatment of anorexia can not be done instantly. To fully recover, it can take several years. While undergoing treatment is not impossible for anorexic patients to relapse and return to an unhealthy diet. Anorexia nervosa can not be prevented completely. However, through parent education of children early in the family, can have a major impact to reduce the risk of this condition when they are teenagers and adults. Education in question is to teach and apply a healthy diet explicitly. In addition, children also need to be taught the right insight about the ideal body image. If in our family there are starting to show signs toward anorexia, immediately consult a doctor to prevent this condition worse. Because people with anorexia are so obsessed with losing their weight as low as possible, the main symptom of this condition is weight loss below healthy limits. In an effort to fulfill their obsession with a very thin body, anorexics will do many things, among them by limiting the portion of food, vomiting up the eaten food, and lying if asked if they have eaten. Anorexic patients generally always wear loose clothes and routinely perform the measurement, weighing, or observation of their bodies in front of the mirror. In addition, they will often exercise excessively and drink appetite suppressant drugs or laxatives. Can also patients taking diuretic drugs (body fluids) and enemas (triggers emptying of the intestines). Dissatisfaction with body weight makes people with anorexia less confident. They feel that their self-esteem is affected by weight. As a result, this lack of self-confidence makes them isolated and no longer interested in socializing with others. Therefore, not a few people with anorexia who eventually have problems in relation to others, especially in the family, friendship, education, or work. From these symptoms, it is clear that anorexia is a psychological problem. Anorexia also causes physical health problems. The exact cause of anorexia nervosa remains unclear. Most specialists believe the disorder arises from a mix of factors, such as psychological, environmental, and genetic or biological factors. Psychologically, the fear and anxiety of the fat body, has led to a strong obsession and encouragement of anorexia sufferers to regulate the body. They assume a perfect body shape is a thin body. But because there is always a sense of dissatisfaction within them, in the end it makes them over-diet and trapped in anorexia. In addition, people with anorexia are also more emotionally closed and easily depressed or stressed. The mindset formed by environmental influences can trigger anorexia, for example, advertising in the mass media. In today's skinny body is regarded as an absolute requirement of beauty. Thought is then reinforced and disseminated by advertising, so not a few people are affected, especially teenagers. The reason why most people suffer from anorexia among teenagers is the number of body changes, hormonal changes and times of stress or anxiety. At this time, adolescent self-confidence is so low that they are often hesitant and easily influenced. In addition to the effects of hormones, ridicule and pressure experienced by a teenager in school can also trigger anorexia. Meanwhile, anorexia nervosa can also arise due to the demands of professions and events that disappoint, such as breaking up relationships. Examples of professions that are vulnerable to anorexia are athletes, models, dancers, actresses, and actors. A person who has a family history of eating disorders, depression , or drug addicts, is believed to have a greater risk of developing anorexia. In addition to hereditary or genetic factors, anorexia is thought to occur due to changes in hormone levels and brain function as well. These changes may affect the part of the brain that controls appetite or trigger a feeling of guilt and worry because of eating a lot. In diagnosing anorexia, the physician first asks first about the patient's diet and weight, such as how much he or she worries about his weight and whether to vomit frequently the food he has consumed. After that the doctor will also collect data about the patient's weight, especially if the patient is experiencing significant weight loss. To determine a healthy weight, the doctor will calculate body mass index (BMI) or body mass index (BMI). BMI is a weight calculation that refers to a person's weight and height ratio. The benefit of calculating BMI is to see if a person has a healthy overweight, deficiency or weight. Normal BMI for adults in Asia is 18.5-22.9 (kg / m2), whereas normal BMI for children and adolescents depends on their age. In adults, anorexia may be suspected if BMI is below 17. To diagnose anorexia nervosa does not require specific laboratory tests. But if doctors suspect drastic weight loss patients are not caused by anorexia but by other diseases, blood tests and X-rays may be done to confirm. In addition, laboratory tests will also be conducted to see the existence of organ damage due to weight loss. Someone susceptible to heart problems if they have anorexia, including low blood pressure, arrhythmia, heart valve disease, fluid buildup or edema (on the hands, feet, and face), and heart failure. To ensure this, the doctor will perform blood pressure, pulse, hand and foot examination, and, electrocardiogram. The doctor may also ask the patient to perform simple physical movements to see if the muscles' strength of the patient is disrupted by anorexia. Examples of such physical movement tests are squatting, standing, and shifting when seated. Occasionally treatment should be done forcibly if anorexia conditions have entered a dangerous and life-threatening stage. In such cases, the family should immediately bring the patient to the hospital to be handled quickly. Treatment of anorexia nervosa is usually done by combining psychological therapy with a controlled weight gain. It is important to make treatment as early as possible, especially if the patient has lost a large amount of weight. In addition, immediate treatment can reduce the risk of complications. 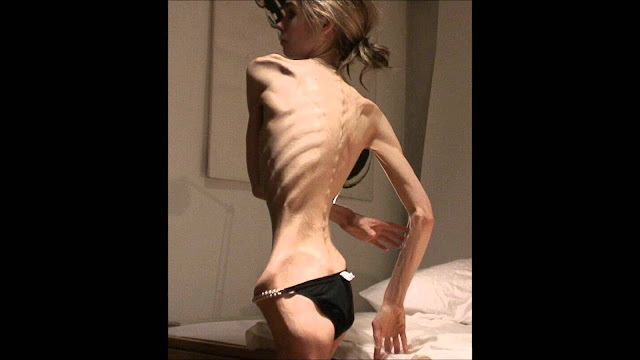 If the severity of anorexia nervosa is very severe with the symptoms of malanutrisi that can lead to death, then the handling in the hospital needs to be done. In this case the patient will be given intravenous fluids or fitted with nasogastric tubes to channel food through the nose. Hospital care is intended to treat dehydration, heart rate disorders, and electrolyte imbalance. Treatment by the hospital is also necessary if the patient experiences signs of major depression leading to suicide attempts. Because it is important for families to always monitor the psychological condition of anorexia sufferer so this can be prevented. As part of the treatment plan, your doctor will include suggestions on how to safely raise the patient's weight. The doctor will also continue to monitor the patient's physical health. For pediatric and adolescent patients, their height will be checked periodically to ensure they grow normally. Raise the weight normally should be done gradually. As a first step, the therapist will usually ask the patient to try to eat regularly, albeit in small portions. This therapy is considered successful after the patient's diet back to normal with adequate nutritional intake, including vitamins and minerals. It is expected that through this therapy, patients can re-raise the weight by half to one kilogram per week. A number of psychological treatments can be applied to treat anorexia. Usually treatment will last for half a year to one year, or even longer depending on the condition of the person or the severity of anorexia. One example of the method of handling anorexia through psychological aspects is through behavioral therapy to change the negative mindset. One's behavior is usually the fruit of his mindset. And vice versa, behavior can form the mindset as well. Many unrealistic things are believed to be true by anorexics. For example they feel their self-esteem depends on their weight. They are very afraid of being ridiculed or disrespected by others because they are considered fat. Therefore, through cognitive behavioral therapy, the therapist will try to help the patient change negative thinking about food and appearance into a positive and realistic thinking pattern, so that expected deviant behavior of the patient can be lost. The second method of treatment is through analytic cognitive therapy by tracing the patient's past. This therapy is based on the theory that mental health problems including anorexia are caused by unhealthy patterns of thinking and behavior that have been formed since childhood or adolescence. Analytical cognitive therapy involves three stages of the process. The first stage is reformulation. At the stage of reformulation, usually a therapist will seek out past patient experiences that may be the reason why unhealthy patterns can develop. The second stage is the introduction. A therapist will help patients see and understand how these unhealthy patterns contribute to anorexia. The third or final stage is a revision. At this stage, a number of changes that can stop these unhealthy patterns are identified, studied, then applied. The third method of treatment is interpersonal therapy to assess the environment of the patient. This therapy is based on the theory of environmental relationships with anorexia which the environment and people around have a very strong influence in shaping the psychological condition of people. The theory concludes that the low self-esteem and the anxiety experienced by the sufferer arise from interaction with the people around. During this therapy, the therapist will try to examine the negative things related to the patient's interpersonal relationship and find out how to overcome these negative things. The role of the family is very important for the recovery of anorexia because usually the family is the party who feel the impact of anorexia itself. In addition to trying to understand the conditions being experienced by people, the family can also work with doctors in helping speed up the healing process. If anorexia is treated solely by taking medication, usually the result will not be effective. The use of new medicines will be effective when combined with other therapies. Drugs are also used to treat psychological problems associated with anorexia, such as depression and obsessive compulsive disorder . Drugs that may be given include antidepressants, antipsychotics, and mood stabilizers. Examples of commonly prescribed drugs include olanzapine and selective serotonin reuptake inhabitors ( SSRIs). SSRIs are antidepressants. These drugs can help relieve depression and anorexia-related anxiety. Usually the doctor will give this medicine if the patient's weight has returned to normal. Giving SSRIs to patients with underweight weight is feared will cause adverse side effects. While olanzapine is a drug that is usually given to people with anorexia who do not respond to other treatment methods. These drugs can help relieve anxiety associated with diet or weight. Treatment of anorexia can not be done instantly. To fully recover, people may take several years because even after treatment, some of them still have eating disorders. Some health problems or even death can occur if anorexia is not treated immediately. Complications arise due to lack of nutrients needed by the body, in this case from food intake. In addition to anorexia nervosa, there is a similar condition called bulimia nervosa . Some patients with advanced anorexia experience bulimia. People with bulimia usually eat as much as possible before they remove it again by vomiting or taking laxatives. Examples of complications that can arise from anorexia include anemia, electrolyte fluid imbalance, constipation, decreased blood pressure and respiratory rate, irregular heartbeat, and even heart failure . People with anorexia are also threatened with damage to the liver, kidneys, and brain. In children and adolescents, anorexia can inhibit physical development. In adults, especially women, this condition can cause osteoporosis , menstrual disorders , and sterility. While in adult men, anorexia can cause impotence and erectile dysfunction . A pregnant woman with anorexia is at risk of miscarriage , premature delivery, low-birthweight babies, and sometimes childbirth should be assisted by a c-section. Therefore anorexic female patients need to be monitored regularly by doctors since the time of pregnancy and after childbirth. When it is recovered, supervision should be done again if the woman is pregnant again because of the potential for anorexia to relapse is quite large. 0 Response to "What Is Anorexia Nervosa?"